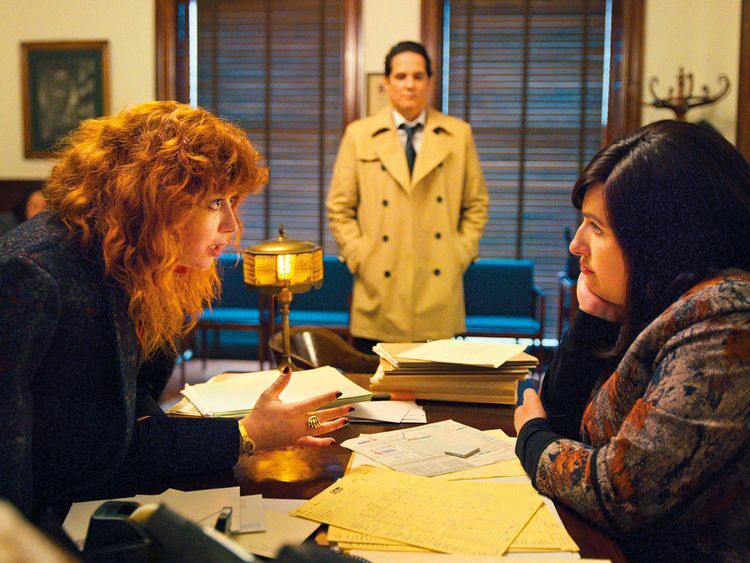 ‘Russian Doll’, which is now streaming in its eight-episode entirety on Netflix, is a beautiful puzzle piece, a circular, multiplane, existential mystery-comedy set in the villages of Lower Manhattan. Peopled with memorable characters large and small, it’s a show that having watched once — not hard to do straight through and hard not to do straight through — you may want to watch again, to admire its machinery and joinery and find the clues you might have missed, but also because it feels just as good the second time around. Natasha Lyonne, who co-created the series with Amy Poehler and Leslye Headland (‘Sleeping With Other People’), plays Nadia, a video game software engineer who keeps dying violently, often to slapstick effect, on the night of or the day after her 36th birthday. Each time she returns to the bathroom of the loft where her artist friend Maxine (Greta Lee) is throwing her a party she’d rather not be at for a birthday she’d rather not be having; Harry Nillson’s sonically cheery, lyrically weary ‘Gotta Get Up’ greets her on the soundtrack at every return. It’s also the birthday of their friend Lizzie (Rebecca Henderson), which may account for the crowd; Nadia, though she can talk to anyone, in more than one language, is not exactly a people person. And her cat has been gone for three days. The structural and thematic resemblances to ‘Groundhog Day’, in which the universe conspires to refine a character through repetition, are clear, but there is nothing unique in that borrowing by now. A quarter century on, it’s just cultural currency — a template, like ‘A Christmas Carol’ or ‘The Bad News Bears’, upon which to build fresh tales, an armature to support original shapes. As a circular story that provides new information with every fresh turn of the wheel, it also resembles ‘The Good Place’. There are also elements of the parallel-universe film ‘Sliding Doors’ and of every story in which strangers are forced by circumstance to work together to solve a mystery, which is to say it has Alfred Hitchcock in its DNA as much as it does Harold Ramis. Above all, it’s a video game narrative in which the game kills you and sends you back to the beginning — Nadia trying to get downstairs alive is a motif — and you get better, maybe, at not being killed. (“I’ve never lasted this long before,” Nadia observes during one cycle. It’s also a double-entendre.) And to win the game, and end the story, you have to discover the purpose of the game you’re trying to win. In classic detective-story fashion, the action travels from place to place as Nadia looks for clues and tests her theories: a synagogue, a Salvation Army shelter, parks and delicatessens, jewellery store, bars and back rooms. Is it something in the joint she smoked? Is Maxine’s loft, formerly a yeshiva, haunted? Is she dead? Along the way we meet John (Yul Vazquez) who blew up his life for her; Mike (Jeremy Bobb), a pontificating one-night stand; a sort of guardian aunt, Ruth (Elizabeth Ashley, still glamorous and great) who is also a therapist, though not Ruth’s; the delicatessen clerk (Ritesh Rajan) who is a co-custodian of Nadia’s cat; and Horse (Brendan Sexton III), a homeless man who cuts hair. Finally — and this is a small spoiler if you want to skip ahead — at the end of the third episode, in a falling elevator, she meets Alan (Charlie Barnett), whose story and character are a looking-glass counterpoint to hers. (In a tidy audio analogy, his appearances are accompanied by classical music, as hers are by pop.) Where Nadia is seemingly all over the place but in fact highly focused, Alan leads a highly regimented life in order to keep from falling apart. Alan has played one of Nadia’s video games, “an impossible game with a single character who has to solve everything entirely on her own — it’s stupid,” though he is only describing himself and, of course, stating a theme. The series’ points are hardly hidden — indeed, they’re explicitly stated, over and over again. If in the end it’s just a long meditation on the idea that people need people, a four-hour metaphorical expression of the fact that you have to abandon old patterns to move forward, it is wonderful all along the way and magnificent in its conclusion. Its last minutes are as deftly handled, wise, unpredictable and rewarding as television ever is. And these ideas are no less powerful for being obvious; the world is choked with people trying to realise them in their own lives. Lyonne, especially, is marvellous, playing Nadia, as a sort of mix of Al Pacino and Julie Kavner (with maybe a hint of Larry David). It’s a terrific performance, wide-ranging and yet highly particular, in which self-protective vulgar bravado is softened by expressions of intelligence and tenderness. A self-described tough girl who looks “like if Andrew Dice Clay and the girl from ‘Brave’ made a baby,” she is shielded from the world by her thick tangle of curly hair, a cloud of cigarette smoke, a wall of caustic humour (“It’s my bad attitude that keeps me young,” she says) and an overcoat she pulls into like a tortoise shell. It is cold out in this fundamentally warm New York story. Is ‘Russian Doll’ a Russian doll — those increasingly smaller wooden figures that nest one inside another — past the fact that Nadia is Russian and, relatively speaking, doll-size? In a sense, perhaps, in that the world begins to contract. (Keep an eye on the flora and fauna.) Solving the mystery does become a kind of race against time, if only to add endgame pressure to a story that otherwise could cycle forever, until the end of television, as viewers grew old and Nadia remained 36. But maybe it’s just an intriguing title.